EV Cargo has made series of executive and management appointments following the successful group-wide festive trading period. EV Cargo has four operating segements: express, global forwarding, technology and logistics. Following the consolidation of six UK logistics businesses in November 2018, the chief executives of each segment take a place on the group board while still retaining their current roles within each individual company. They will report directly to EV Cargo chief executive Heath Zarin, who will head the logistics segment. Palletforce chief executive Michael Conroy will head the Express segment, Clyde Buntrock from Allport Cargo Services will head the global forwarding and Adjuno chief executive Craig Sears-Black will oversee the technology segmement. CM Downton, Jigsaw and NFT will operate within the logistics division. The individual business saw some management changes. Duncan Eyre has been appointed managing director of CM Downto. Andy, Richard and John Downton have transferred to non-executive roles. Zac Brown has joined CM Downton as operations director while finance director Ben Armstrong moves to the role of finance director of the EV Cargo logistics unit. Steve Back has been appointed Palletforce chief financial officer, replacing Neil Carpenter who has been appointed as a senior advisor. Mel Brockhouse and Aaron Scott will become joint managing directors of NFT as Ross Eggleton becomes senior advisor for EV Cargo to develop strategic initiatives across the group. 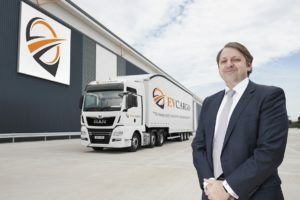 Clyde Buntrock is to take over as chief executive of Allport Cargo Services in March as Charles McGurin moves to a non-executive role within the EV Cargo group.